Ancient Moves & Modern Grooves! Fun and fitness for the entire family…..Youth, Adults & Elders! Get ready and get fit for 2014 with our 1st Annual 2014 Winter Bootcamp! December 3, 5, 10, 12 and 17th at Piedmont Avenue Elementary School. You have the opportunity to take all 5 classes for only $40, and classes are just $5 for Youth, Students and Seniors! Unfortunately the obesity rates in the USA have tripled in the past 3 decades. 1 in 3 youth are currently obese or overweight and 40% of African-American & Latino youth are obese or overweight. One-third of youth born after the year 2000 are expected to suffer from diabetes or other chronic diseases such as heart disease, high blood pressure, cancer or asthma. THIS IS UNACCEPTABLE! Our youth deserve a better and healthier future! We all deserve a better today! AfroDIVA DANCE infuses a preventative and evidence-based curriculum centered around African-dance to encourage healthy and happy lives for our present and our future. Get ready for the NEW YOU and the NEW YEAR! 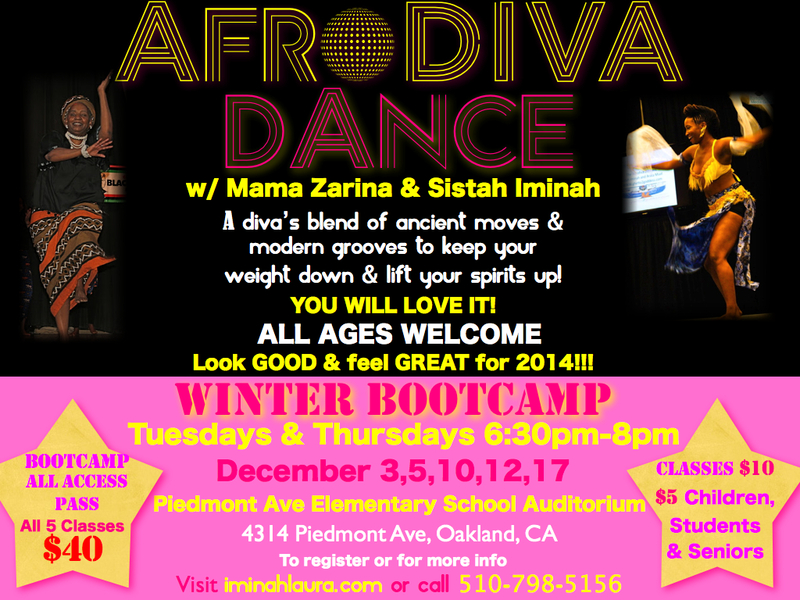 AfroDIVA DANCE your way into health, happiness and all things DIVA!!! Ancient moves and modern groves to keep your weight down and lift your spirits up! This is not just a class, but a full and enriching experience, giving you nutritional education, stress management, self-esteem building, cultural enrichment AND an excellent workout . 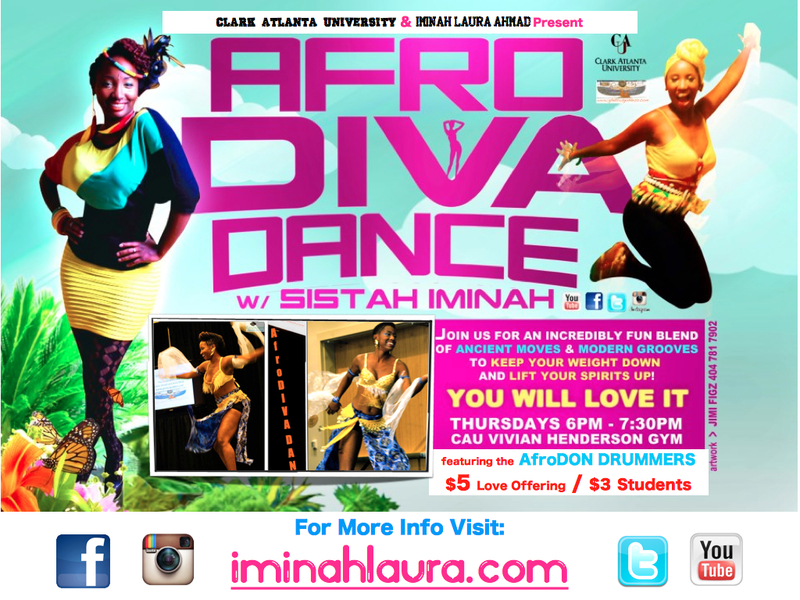 AfroDIVA DANCE is part of Clark Atlanta University’s Fitness Program and thanks to a sponsorship it was offered for FREE for the Spring 2013 Semester. Due to a demand from faculty and staff, Iminah Laura Ahmad and Clark Atlanta University have continued their partnership beyond the school year and into Summer 2013. The class is being offered for $5 for the general public and $3 for Youth, Students & Seniors. A great experience for the entire family! Founded by Iminah, the cutting-edge AfroDIVA Dance System introduces people from all walks of life to the exciting and enriching world of African dance and African culture.Dance is a fun and exciting blend of ancient moves and modern grooves, incorporating traditional and modern dances from throughout the African continent and throughout the African diaspora. Dances from the cultures of places such as Jamaica, the USA, Senegal, Haiti, Guinea and more are all represented in the AfroDIVA Dance system. oDIVA AfroDIVA DANCE features the AfroDON DRUMMERS, led by the Afrikan Godfather Baba “Yoga” Bey. The Afrikan Godfather brings a wealth of knowledge & wisdom to the class in the realms of Afrikan drumming, yoga, tai chi, chi gong and overall positive energy. Thank you to everyone who attended the 2013 Children’s Afrikan Ball! Iminah had a GREAT TIME hosting. The children and parents had a BALL! includes a soulful vegetarian dinner, cultural edutainment by our youth, a taste of Caribbean carnival, and the most fun & memorable experience of a lifetime! 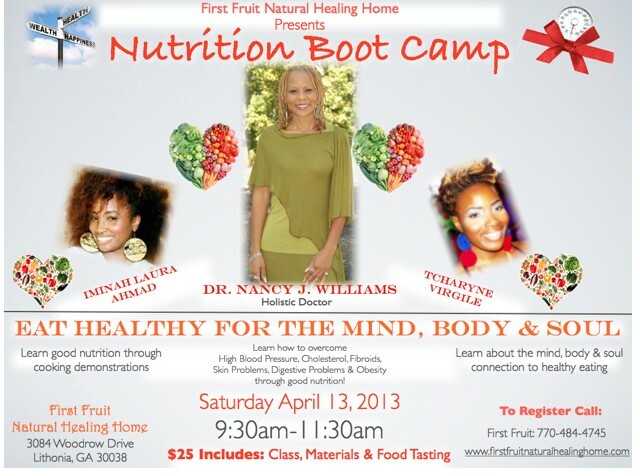 Thank you to everyone who attended our April 2013 Nutrition Bootcamp. We had a packed house, and were very glad to change so many lives! Stay tuned for our May 2013 Bootcamp, details will be announced soon! EAT HEALTHY FOR THE MIND, BODY & SOUL. *Learn about the mind, body and soul connection to healthy eating. Registration is just $25 and includes the class, materials and a food tasting.